Forton is a wonderful little place, a classic micro village - a hamlet really. What action there is happens up on the main road by the popular Swan Pub, but the beauty lies just to the south. 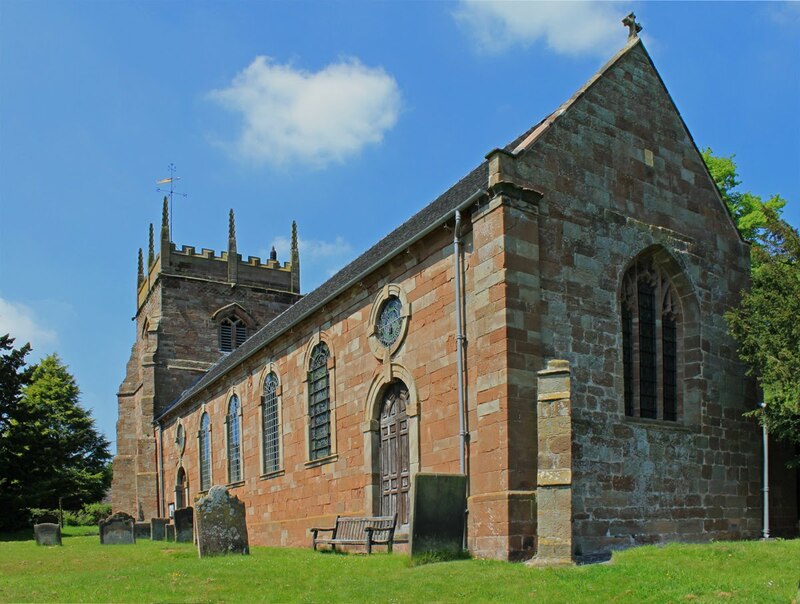 You freewheel down a hill and there before you is an exquisite sandstone chrurch (open during the hours of daylight) and nestling next to it is the old Manor House proudly bearing the date of its construction in 1665. I bet the two buildings could tell a tale or ywo. By the time we arrived it was 1.00pm and the sun was intense. After an exploration of the church we pulled a bench into the shade of a yew tree and cooled off eating our lunch. All was silent save the birdsong, it was one of those magic moments. 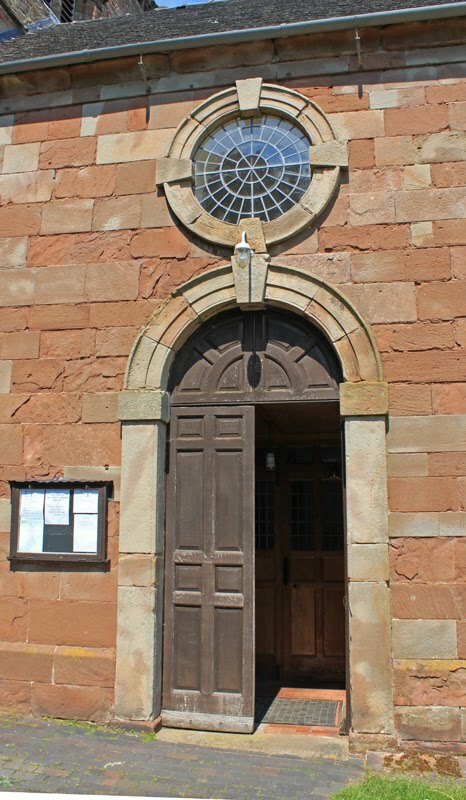 The old buildings offered some great material for photos but due to the angled the vertical distortion was huge - they looked like the Leaning Tower of Pisa. No problem, I have the technology in the shape of Adobe Photoshop Elements and all has ben straightened up. All this image manipulation is getting fun. 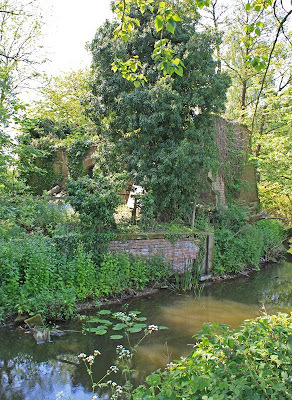 After lunch we rode down to the river and there beside the aqueduct was the ruins of an old corn mill nestling in the trees. 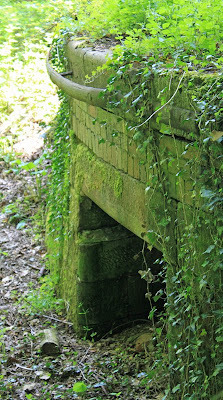 Did I mention an aqueduct? 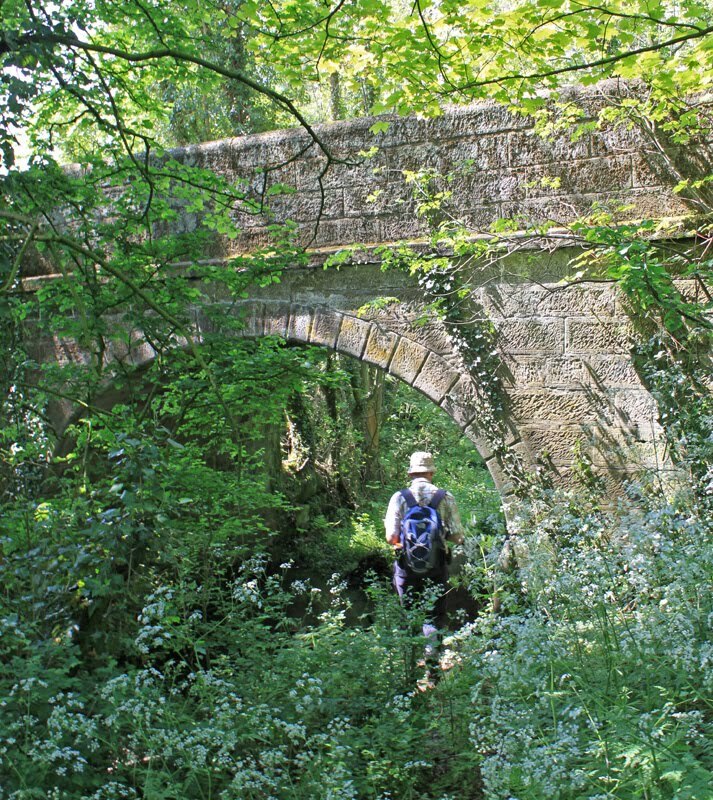 Its a gem, but more of that and the infamous skew bridge tomorrow. From being well ahead on the course, life's manic schedule has pushed me behind. I have just completed the assignments for week three which was all about capturing movement and working in low light conditions. The movement exercises were really challenging, forcing me to take full control of the camera in manual mode. This is pretty scary territory for someone who spends most of his time in automatic, or sometime auto creative when I feel a bit adventerous. This pushung of the boundaries is what the course is all about and whilst I produced some images which were technically useful, they were not the sort of thing I would want to share outside the confines of the OU discussion forums. Night photography is, however, another thing altogether. 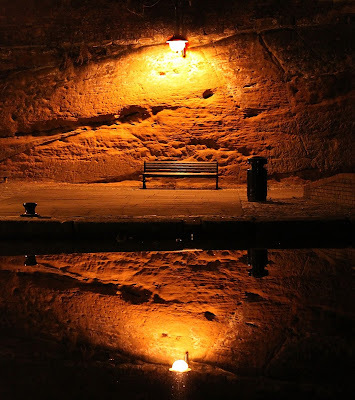 I love the images a good camera can achieve in the dark / very low light and for this exercise I actually used an image I took at Castlefields Manchester during our Easter trip, and one which has featured on the blog before. I am aiming for an artistic image of how it felt at the time rater than a completely true representation if what was there. I also find it is easier to make compositional mistakes when you can't see much of your subject, so I felt no compunction in using the various dark room tools at my disposal to make adjustments. It's interesting that whilst the image attracted positive comment in its original form, my subsequent rework resulted in a quantum leap in positivity. Is well as recropping the image I have cloned out the concrete block on the top right, levelled off the waterline, lost the shadowy floating chip box and used the burn tool to pull out some of the mid tones in the otherwise burned out light and rock beneath it. I am pleased with the end result, but you are best judge, what do you think? As to the course, I have just completed two weeks reading in two days which is just as well because we are off on the boat for whit week and I have my computer marked test when I get back - not that I give a jot for the results. Getting OU points is must certainly not that this is all about. Expect more on depth of field and colour when I have done the practicals, and where better to do this work than about Wand'ring Bark? As you leave Lower Oulton it is fair to say that the line of the Newport Canal becomes indistinct verging on the invisible. 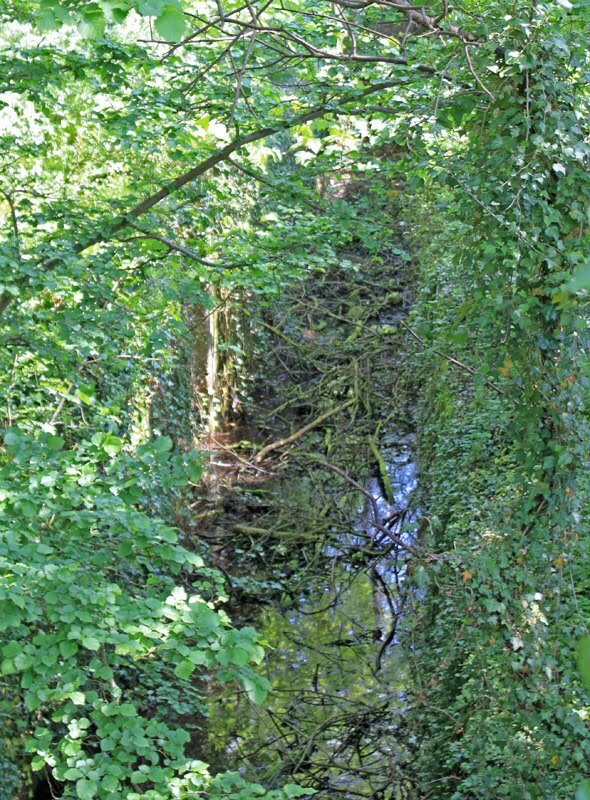 Agriculture has reclaimed the line, which reverted to it's original owners on formal abandonment as a navigable waterway. 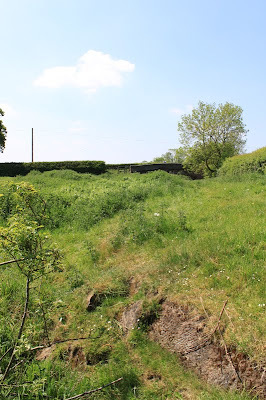 Between Oulton Bridge and Blacklane Bridge there lie the remains of five locks, not that there is much to see on the ground. 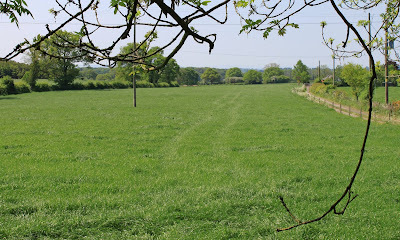 A farm track here, a fence there or sometimes a pair of parallel hedges - oh the excitement of it all. 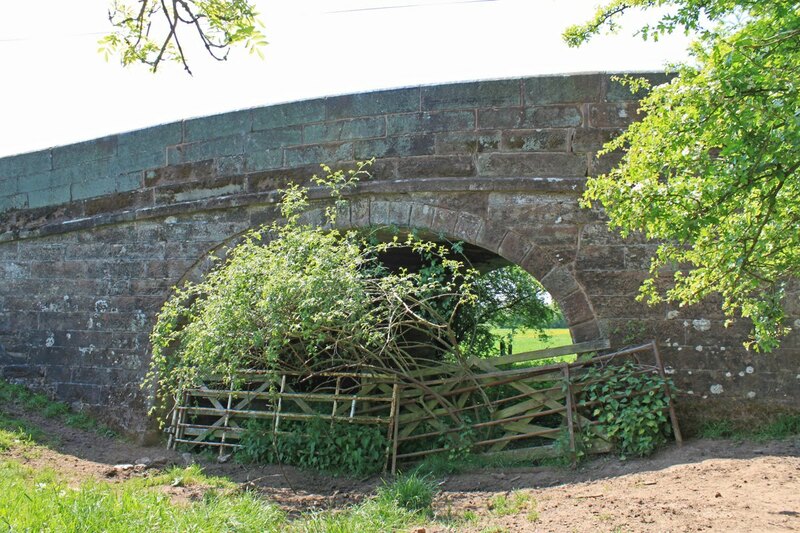 Blacklane Bridge still stands, but access to it's foot is impossible and our investigations were restricted to viewing the iron rope guard on one side and a view up the canal to the east. Staff Bridge offers a bit more scope with easy access to the field below. 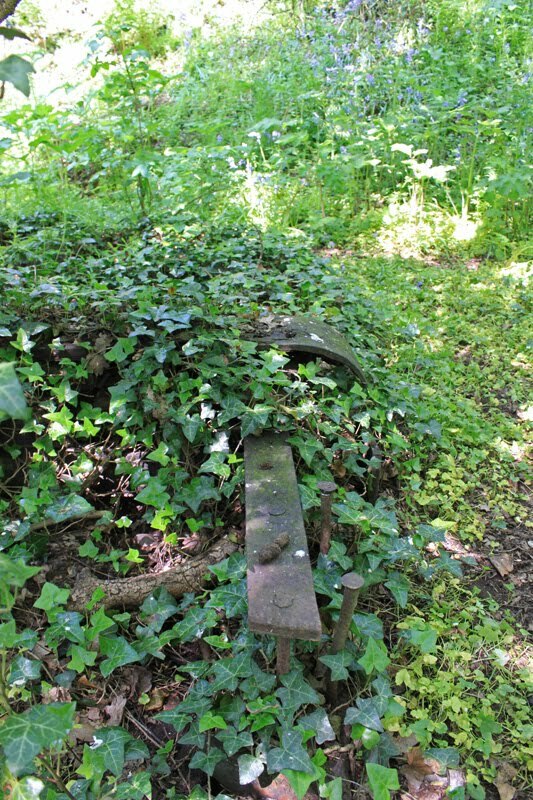 To the east the remains of a lock chamber can be made out as a long thin depression sprouting a healthy bunch of nettles, with the upper jaws poking through the grass. To the west there were three more locks, but their location is only identified by three evenly spaced teraces in a field covered in Cowparsley and Buttercups. 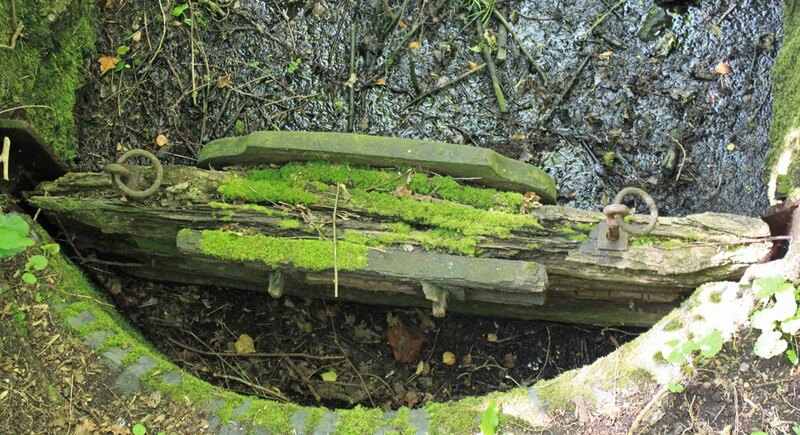 After the excitement of Norbury's abandoned locks, this section is a bit of an anti climax, but then it gets even worse. The next mile or so is completely inaccessible and a long diversion is called for through Sutton, only returning to the canal at Forton. 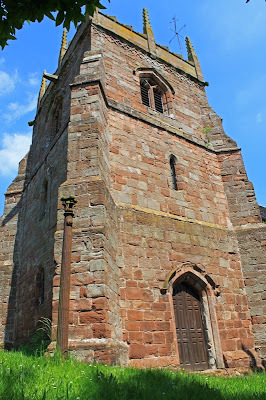 Ah, Forton - there is so much to write about that village, but you will have to wait till tommorow for that story! This is the second in C J Sansom's four book Shardlake series, the continuing tales of the medievel lawyer come investigator. 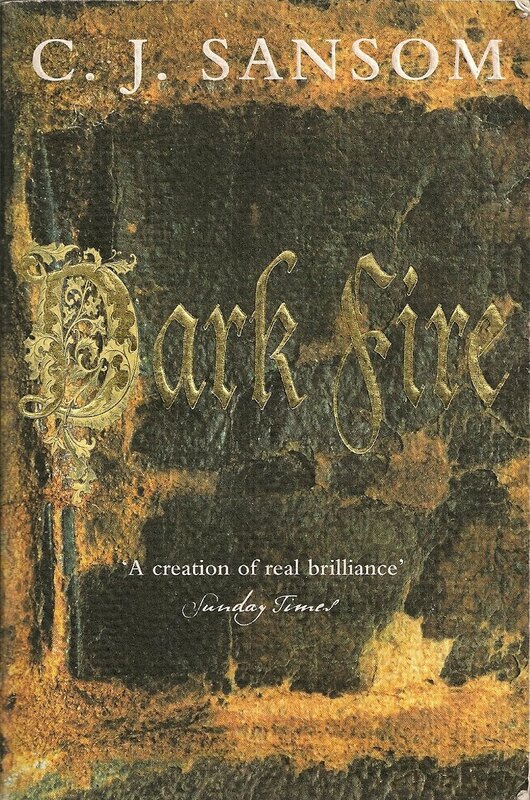 Once again Shardlake is summoned to the service of Cromwell to investigate the possibility of a mysterious substance known as Dark Fire. If this technology was employed by the Crown it would render our navy almost invincible, but the substance and the machine which uses it seems to have disappeared - together with just about everyone who has had anything to do with it. Is is real?, if so what is it?, what can it do? and who has it? Perhaps most worryingly, who is behind its dissapearance and what does this mean for Cromwell's hold on power which hangs by a rapidly thinning regal thread?. It's a good and plausible tale which rattles around the streets of a historically accurate London, providing an interesting insight into a period I know little about. But, as with my previous encounters with Mr Sansom's work, I find the characterisation sadly lacking. I know a lot about Shardlake the man but little about Shardlake the person. Its really frustrating after two books! So will I read the third and final book? Well yes, probably. Its a bit like Mastermind - I have started so I will finish. Perhaps the most telling fact is that I started this book before we went on the Easter boat trip and it has taken me six weeks to get to the end. Its a decent enough book but only one I would choose if I had nothing else available at the time. Damnation by faint praise I think. I make no excuses for lingering over the Norbury Locks because they are an absolute gem of abandoned canal architecture. 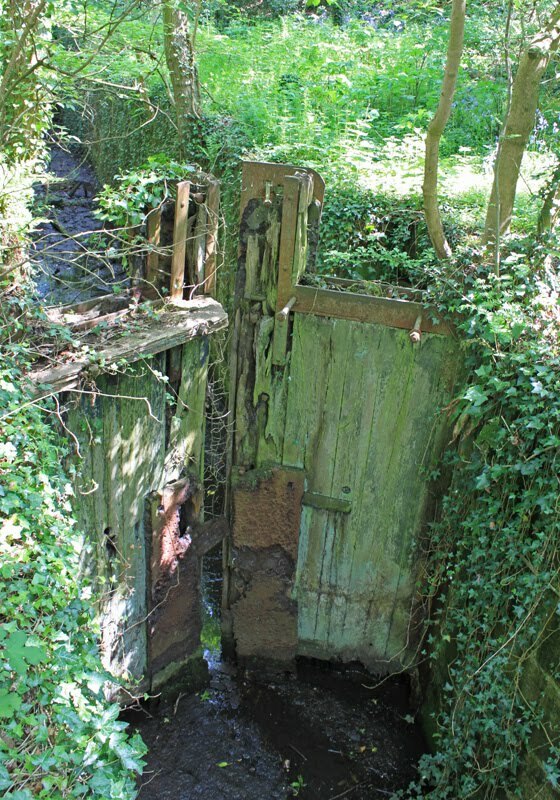 Perfectly preserved with sagging chambers and lock gates quietly rotting away in their hinges, all hidden away in an inaccessible cutting devoid if rubbish or human intrusion. The two locks rising up from Oulton Bridge (No. 4) are the best on the canal with the lower chamber actually containing some water which gives an added sense of being just abandoned. 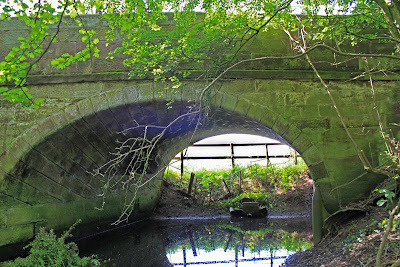 The reality is that beyond Oulton Bridge the canal line is completely lost under farmland and an earth dam has been throw up under the bridge which causes the rainwater to pond up. 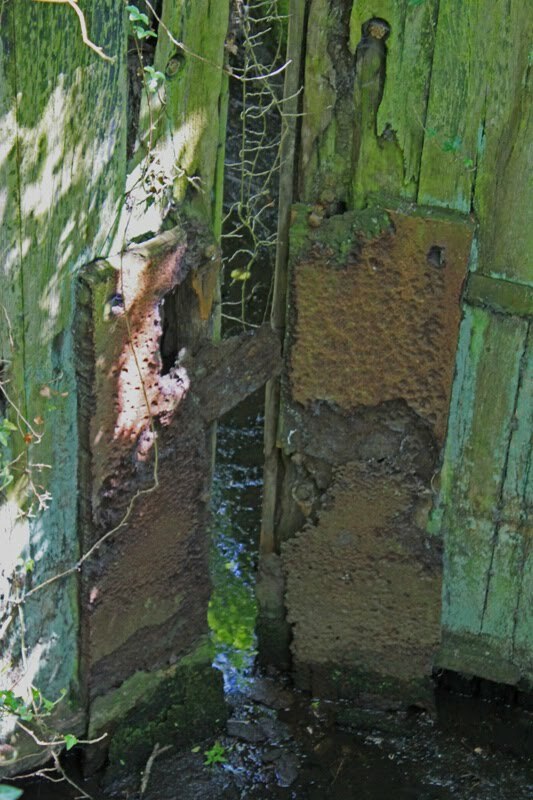 The lock by bridge (lock 7) is the lesser of the two, but lock six stands with it's lower gates in place and it's steel protection plates still attached, prepared to meet the blows of the next boat that will never arrive. 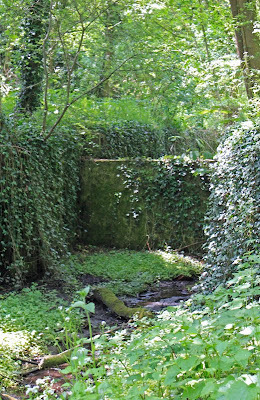 This is a magical place, with the air filled with a melancholic mix of activity passed and wild garlic. We scampered around the remains of this lock like kiddies in the sweetshop, snapping away feature after feature, exactly how the boaters left it all those years ago. These locks reminded me of the archive photos I found of the Bentley Canal in Wednesfield, but this time I am not too late to see them in all their fading glory. 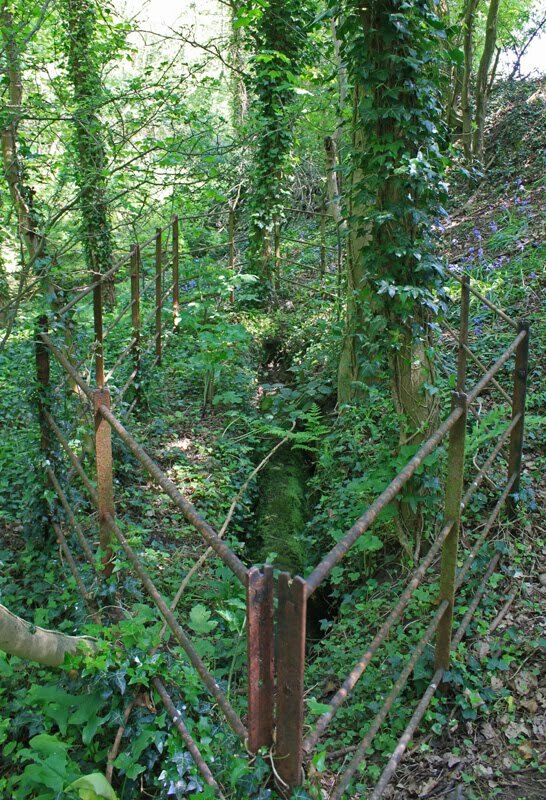 Now before you go tramping into this canal 'holy of holies' to see them for yourselves, remember that this is private lane and no public right of way exists. We picked our way through the site careful to do no damage but were surprised to meet another photographer as we were leaving. He exclaimed surprise at seeing anyone in such a remote location and pointed out the absence of public rights of access. He wished us well and hoped to "see you again - but not in here!" 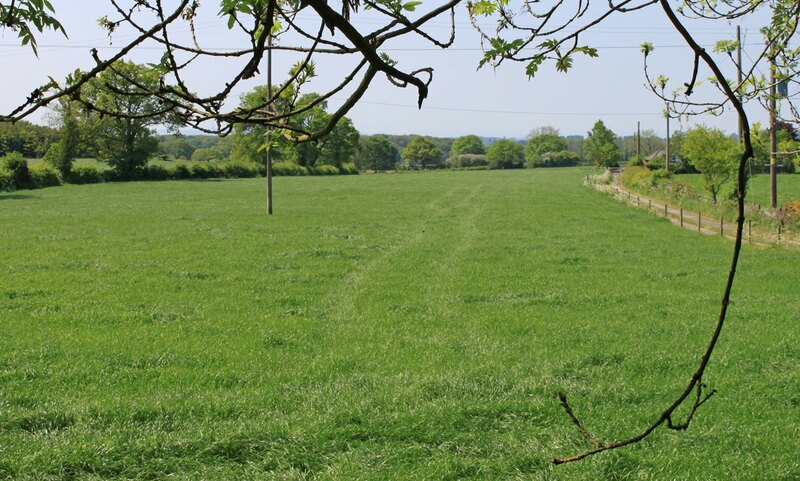 Its the most civilised "get off my land you are trespassing" encounter I have ever had. 5. Leave quickly and with smiles and thanks. 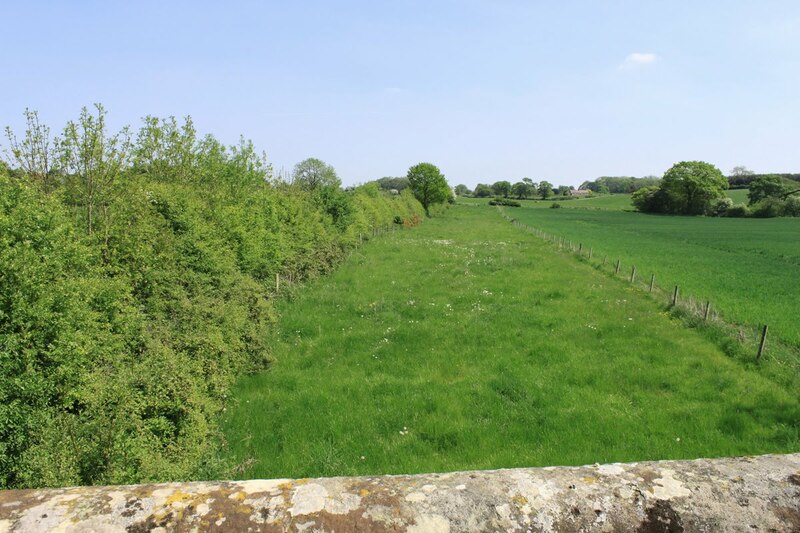 Follow this link to posts covering the Shrewsbury Canal. Well, the sun shone from a blue cloudless sky with the thermometer topping 29 degrees when we finally set out on our much delayed expedition of the eastern end of the Shrewsbury and Newport Canal. 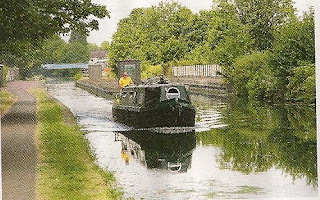 This length is actually the Newport Canal, the final element of a whole network of canals in Shropshire and the one which joined the more distant disconnected elements to the main Shropshire Union at Norbury Junction. This expedition covered the first 10 miles as the crow flies (and as the canal runs) but the bicycles notched up an impressive 20 miles as we dodged back and forth along monor roads and farm tracks to try and stay as close to the line as possible and thereforte seeing all the remaining structures we could. We did a two car shuttle so we could make this a one way trip, parking up on the main road near Wappenshall Junction. We have to start at Norbury Junction and the short arm which remains in water leading up to the dry dock which occupies the first lock chamber on the canal's long drop down to the Shropshire farmland below. We cycled round under the aqueduct to the south of Norbury and along the lane to Lower Oulton, with views across the fields showing the line of the canal stepping down. The view from Maltshovel Bridge in the village gave us our first surprise. We had assumed that the four lock chambers on the hill down from the dry dock had been filled in, but this isn't the case. The first two chamders remain in place and are structurally sound, althought the first is rather covered by vegitation. A walk through the stinging nettles (I was wearing shorts) gave good views of this lock which has had its top gate removed and replaced by a concrete dam wall. The wall serves no purpose as the water supply hs been cut off and the bed above is now virtually dry, dry enough for me to climb inside the paddle culvert and take a closer look at its inner workings. 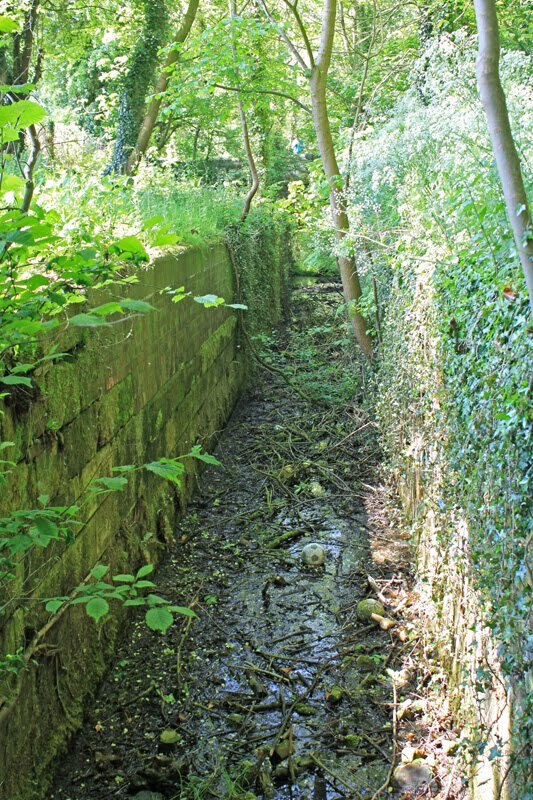 Then the next lock up (number four) emerges from the undergrowth, even better preserved with all this masonry in place and given its remote location in a deep cutting is completely free of rubbish. 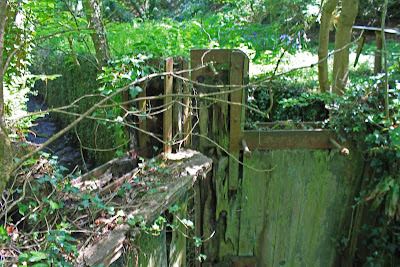 It is just as it was left when it was abandoned 60 years ago. Between the two of them these are the locks that time forgot. 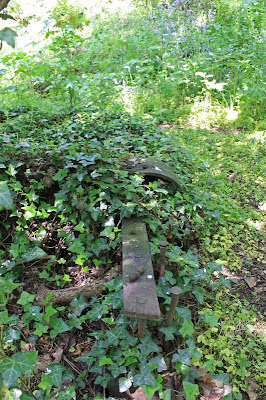 Old top gate on bank - with tree! 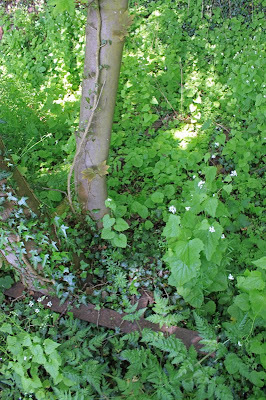 I am not sure what lies beyond because the nettles got too bad and further exploration in the winter is called for then the undergrowth has dies back. Another thing for my to do list. A visited Woking last week to visit the head office of a major fast food chain, and finger licking good they were too. 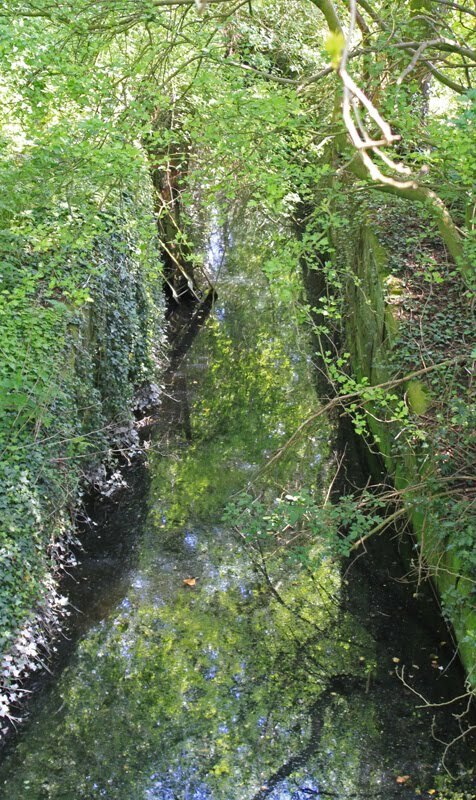 Last time I visited I noticed that the Basingstoke Canal runs through the town to I decided to take a closer look. Now, the Basingstoke Canal is well off my beaten track, way down the Thames and up the Wey, so its not one I am likely to visit anytime soon. But if I cant get to it by water then I will take a look on foot. In total contrast to my recent Planning - Pleasure or Pain? post a couple of days ago, I did absoliutely no planning. I just rolled up to a random bit of towpath above the town and went for a walk with my small camera. 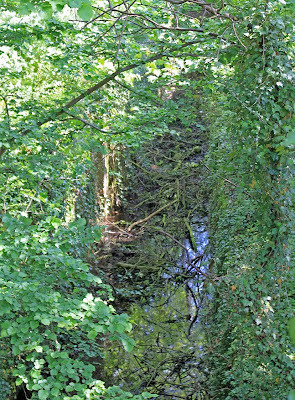 The Basingstoke is a very quiet waterway - with no boat movements at the time of my visit and I suspect little action at any time. 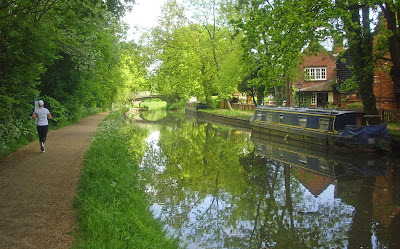 The canal sort of slides past the tow rather than reached into its heart, but it's tree lined route makes for a lovely walk and the paved towpath is alive with walkers, joggers and cyclists. I picked an unremarkable length, just to the west of the town centre with a few bridges but no locks. The channel is broad, deep and very tempting. One day I will find time to travel this lonely offshoot of the system - one day. In the meantime I will take a look at other fragments as the opportunities occur. 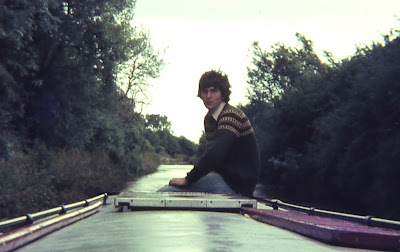 I'm no more keen on the end of canal trips than I am of last days of any other holiday. The best has been and gone, little novelty remains and I am keen to get home. Strange bird at Aston Lock - what is it? This was the last full day of the 2010 Easter trip and the section down the Upper Trent valley from Stone to Great Haywood always seems a bit tedious. The valley is shallow and open, with only the passing trains to break the monotony. One interesting development is the opening of the big new marina just below Aston Lock, another huge boat park nearing completion. We have seen a number of these new marina's over the last two weeks, most of which must have been started before the current recession. I find the economics of these Marina's a bit of a mystery. By my rough calculation there must have been nearly 3000 new berths introduced over the last five years - or put another way a 10% increase in supply. A few years ago when we bought WB you couldn't find a mooring for love nor money, and the adverts sections of the waterways press were empty. Now there are huge adverts promoting spaces all over the country, big exponsive holes in the ground chasing a very finite number of boats, which are not expanding at anything like the rate they once were. 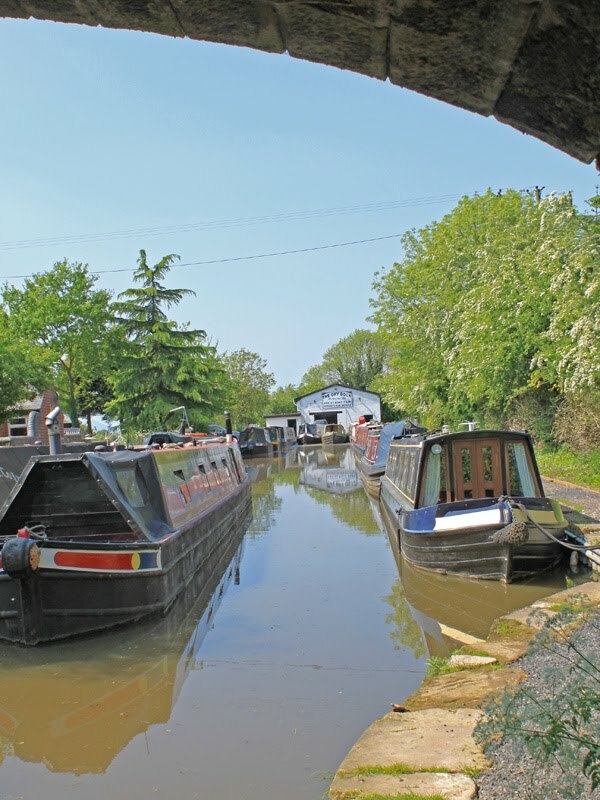 The good news it that if there are too few boats to fill all those costly berths (£6,000 each on average) at least that means that boaters are in the driving seat for once, and that mooring fees are unlikely to rise much in the forseeable future. We had planned a stop at Anglo Welsh in Great Haywood for a re-fuel but all their boats were in and there was no way we could approach the pumps. Never mind, there is always Viking Afloat at Gailey. We paused at Tixall Wide for lunch, mooring just behind nb Lady Godiva which was the subject of a particularly good "Me and my Boat" article in the May edition of Canal Boat. 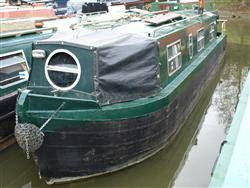 We said our hello's learned off their plans to do the northern canal this summer and bade them farewell. Our passage past the tumbledown cottage at Deptmore Lock brought a surprise - the old lady seems to be back, but how she could live there is a mystery. There are no stairs and the insides seems to have been gutted - maybe she was just on a visit. 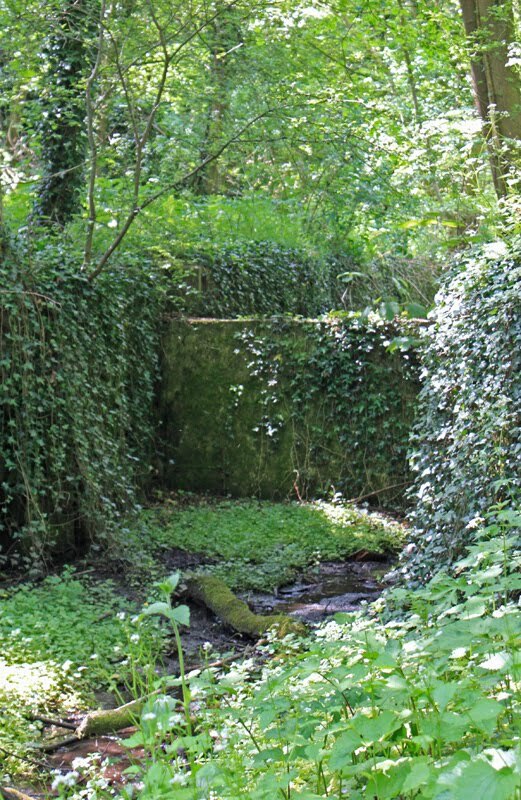 Whatever her circumstances, the place is sad and in need of lots of TLC. The pull up the Staffs and Worcester was under clear blue skies, unusually not criss crossed with the usual exhaust marks of jets on account of the continuing eruptions of the volcano on Iceland. We eventually moored just short of Acton Trussell with the lights of Stafford behind us and the orange glow of the West Midlands conurbation growing brighter in front. We must be nearly home. Planning - pleasure or pain? Planning - a pleasure or a pain? I am by nature quite an organised person. I like to do things in a disciplined manner but sometimes it is refreshing to take a less structured approach and just see how things work out. 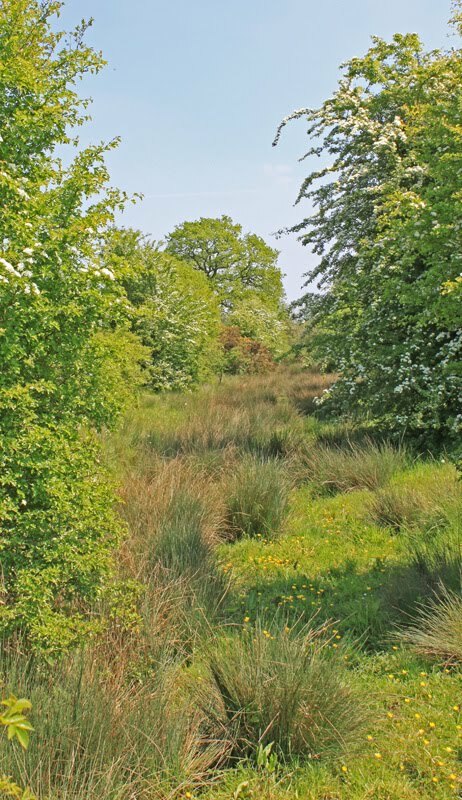 When I started tracking down the routes of lost canals I adopted the "get on the ground and take it as it comes" approach but as I have gained experience the planning has become a much greater part of the project. 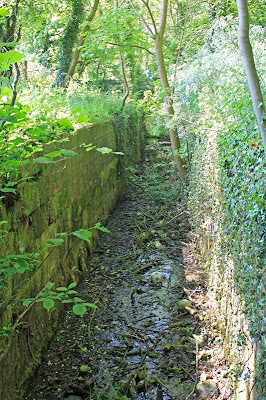 In fact, I can safely say that I am now reluctant to just "have a bash" at a canal because the end result is always the same; I get lost, I miss out half the canal and then I have to come back a second time to do the job properly. But is this planning a pain or a pleasure? Well, initially it felt like a pain but as time has gone on I find the research delivers its own rewards. They do say that "to fail to plan it to plan to fail" and I have seen this principle taked to truly heroic levels. I was once taking part on a two week Outward Bound leadership course and one group was a bunch of mature policemen. We were all set a 48 hour challenge (the sort of thing OB love) and whereas most groups shut themselves away for two or three hours and then blasted into action, the bobbies locked themselves away and didn't energe for 12 hours - or 25% of their alloted time. Even the instructors were getting worried. In the event they had constructed a detailed plan which the executed with military precision and blasted all known records out of the water - all this while us plebs were busy bending the rules till we were threatened with expulsion. It's a lesson I have never forgotten. So, back to lost canal hunting. 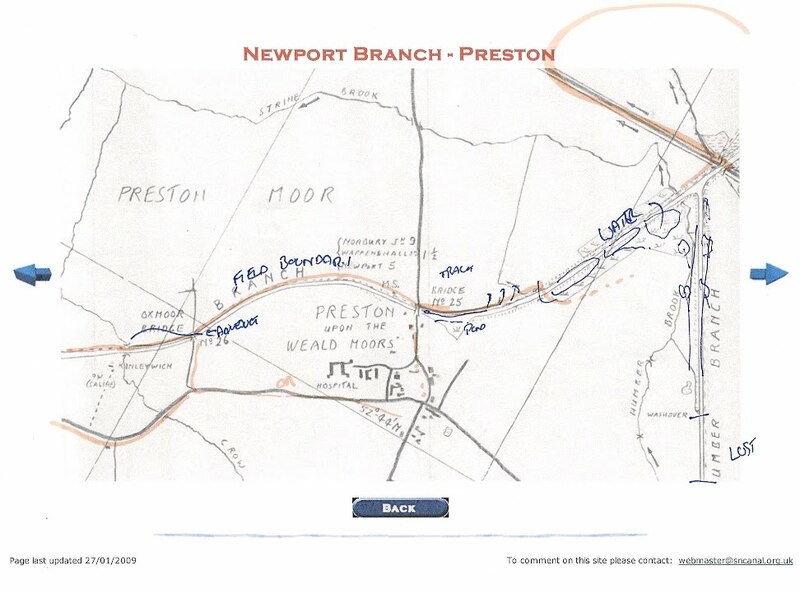 Today represents a whole day given over to following the line of the Shrewsbury and Newport Canal from Norbury Junction to Longden on Turn Aqueduct. This is a long route compared to my usual urban forrays to it will be undertaked by bicycle with myself, Jeff and Dr D in attendance, with two cars being used to maximise the distance we can explore. 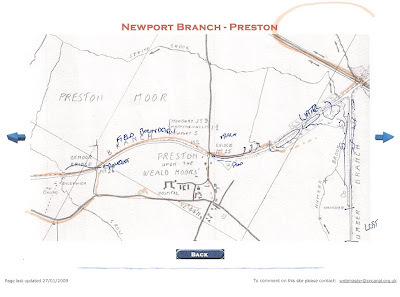 By way of pre work, Dr D has got the OS maps and the history whilst I have located a sequence of hand drawn canal maps from the canal society's website, and marked these up with what is visible from Google Earth. 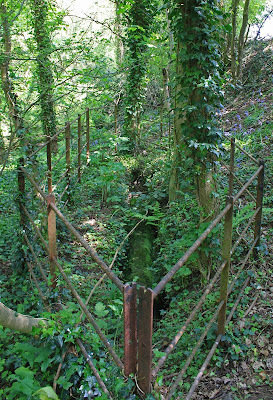 Hopefully the combination of this information will allow us to have an interesting and successfuil hunt as we snake along the route, inspecting what remains wherever access is possible. It's a shame that the towpath isn't a continous footpath, but then maybe that would make it all too easy! So what started as a chore has turned into a pleasure in its own right. I thoroughly enjoyed my two hours marking up the route map with highlighters and a key and am now quite excited about the prospect of a day in the field. All those orienteering skills I have been learning on my Expedition Leadership course are being put to good use already - I havn't mentioned Expedition Leadership have I? Hmm - I can feel another post coming on. 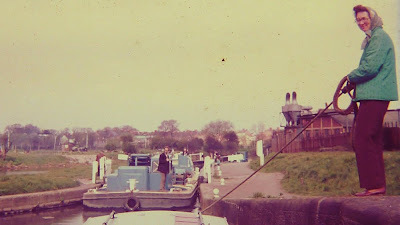 This was one of our later hirings from the now defunct Concoform Marine at Weedon, and in keeping with Captain Ahab Snr's desire to pack as much into his annual week of boating as possible, the desicion was made to get to Stratford on Avon and back in six and a half days. Of course, this meant the Ahab junior was given the task of working the many locks, including both sides of the Hatton Flight in a single day. Oh how I ached at the end! The memory of toiling up the hill at Hatton will stay with me forever, together with the frustration of the slowness of the single paddles locks of the South Stratford. Matilda also has memories of this trip, but due to frustration of a different sort. She was very long suffering about the extended days but she had been really looking forward to an afternoon in Stratford but, because our descent into the town was so slow, we arrived late and just had time for a quick cup of tea in Bancroft Basin before we had to turn round and retrace our steps all over again. Even today, after over 30 years her annoyance is palpable! Given the demands of the trip few photos were taken and the three in this post are all I can find. Regular readers will know that I am particularly fond of the North Walsham and Dilham canal, Norfolk's only true canal and one which ran within a few miles of my childhood home. 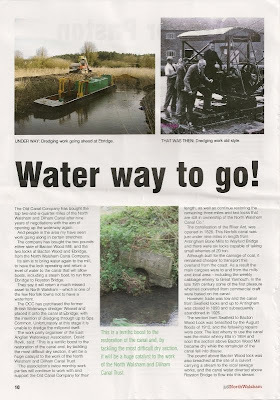 During a recent visit to North Walsham I was given a copy of an article torn from "Just North Walsham" which featured a two page spread on the restoration effort going on just down the road. It appears that a canal sympathetic company called 'The Old Canal Company' has bought the top two and a quarter miles above Ebridge Mill, through Bacton Lock and on to Swafield with the stated intent of opening it up for mavigation. And its not just words, a dredger (Ex BW boat Weasel) has been installed and the lock at Bacton Wood is well on the way to full reinstatement. This great leap forward, after nine years of negotiation, taken together with the three miles and two locks still owned by the North Walsham Canal Company represents a meaningful addition to the inland waterways network. 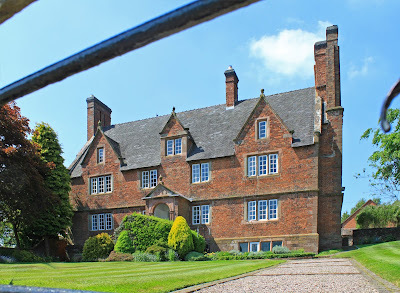 There have been recurring dreams of full restoration, firstly by Robert Aickman in 1953, then David Hutchings in 1972 and now, at last, that vision seems to be inching towards fruition. And the catalyst to this latest progress? The owner of Bacton Wood Mill has restored the internal mechanism and wants the canal restored to bring him a head of water. It seems that the traditional emnity betyween millers and canal owners is a thing of the past. But then, they do things diff'rnt in Norfolk. Its funny how sometimes you don't have cause to think about something for months, and then you see reminders everywhere. 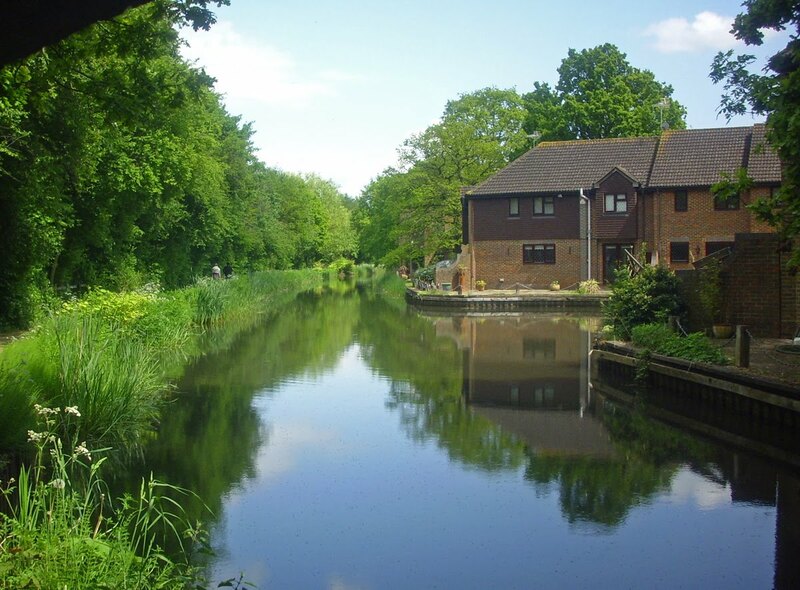 I was in Woking on businesss the other day and my journey home took me near Runneymede, which put me in mind of my trip down the Thames on nb Honey in the summer of 2005. I have already posted an entry about this trip, which was full of incident, but no sooner had I thought about Mr Primrose's leaky Springer than I saw a photo of her in the June edition of Canal Boat. Actually, that isn't strictly true because I saw two completely unrelated photos of her in the same publication. The first was within the regular Whilton Marina page advertising her for sale under the misspelt name Anni Devon (£14,950) which had me heading for their web page to get a better look. The insides have all been renewed but the outside is still the British Racing Green I painted on her five years ago - but freshly recoated for sale. The on line ad suggests she has a flat bottom but, unless she has been rebottomed in the last few years, that's wrong as, like most Springers, its a wobbly V.
Sorry about the quality - it was a tiny thumbnail! 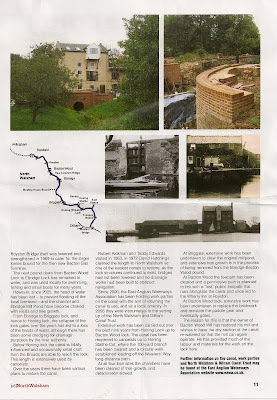 But then there is the second photo, this time in one of the the small thumbnails in Derek Pratt's "The Secret side of London" feature, with Honey / Anna Devon powering over the North Circular Aqueduct. I didn't spot her at first glance but closer inspection revealed the dodgey cratch I fabricated out of some recycled ply, and the light I added to the right hand side of the unusual circular window - 10/10 for function and 2/10 for beauty. If that isn't enough proof, there is a bow fender chain dangling down in both Derek's photo and the one advertising it in Whilton's pages. I have very fond memories of Honey / Anna Devon so hopefully someone will fall in love with this 30 year old classic and keep it moving round the system for a few more years. These days of endless sunshine just seem to roll on and on - when will it ever end? Sure it's a chilly easterly wind driven in by an unusual cyclonic weather system, but two weeks without rain at Easter is amazing. Our moorings near Ramsdell Hall were idyllic and a quick walk down a frosty towpath at 7.30am was rewarded by a bunch of lovely misty photos. I often think that this first hour of the day is the best - better even than twilight. Ramsdell Hall is an impressive place, and still in private hands owned by the guy that built the Kwik Save supermarket chain. We made a brief stop at Hertiage Boatyard for a pump out, which was relatively expensive at £16. But that included a pint of blu and a very thorough rinse out. All in all I would say it was fair value for money. The highlight of the day had to be the passage through the Harecastle Tunnel. After the Standedge Tunnel the Harecastle is my favourite and, in spite of making several trips through it, this was the first journey from north to south. I have to say that the journey in this direction is probably the best, allowing the tunnel to show off its party piece at the very end. We enetered after a reasonable 30 minute wait and motored on for 45 minutes accompanied only by the distant runble of trains in the adjoining tunnel. Unlike the northbound passage, there is no gradual dawning of light from an initial pinprick as your near the end. Instead the blackness seems to go on for ever and you gradually become aware of an ever strengthening droning from the extractor fans. To ensure that the fumes are pulled out of the tunnel the southern end is covered by an airproof door, which is thrown open at the last moment by the tunnel keeper who has been watching your approach from a small cubby hole in the side of the shaft. You are then left blinking like a bemused mole as you return to the land of the living in the northern environs of Stoke on Trent - a nautical rabbit out of the hat. 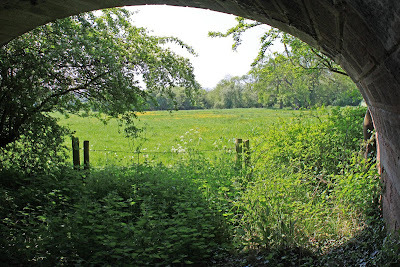 There is an older and narrower tunnel just to the west which was the Brindley original, initially used for southbound traffic but abandoned after subsidence and last passed through by canoes in the 1960's. It it now highly unsafe and believed to be completely blocked. 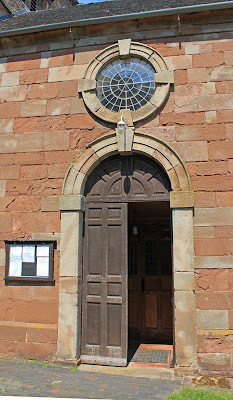 It was then on through the various towns which together make up Stoke on Trent - Hanley, Burslem, Stoke etc. The route through Stoke offers a good selection of old industrial buildings, the real thing and not recreated representations of what went before, as seen in so many other places. These ones are aged, crumbling and sagging - mostly abandoned but really interesting if you like industrial history. The distinctive bottle kilns are particularly attention grabbing. Odd looking characters popped up from time to time on the towpath, and whilst some looked threatening, none caused us any trouble and all sauntered off after exchanging plesanteries. On reaching Meaford Locks I had cause to consider the relative merits of living with a vintage engine. I can see the attraction of a slow running lump but I am not so sure about the smoke issue. We came up behind nb Catkin who was out on a maiden journey to test a new more powerful diesel engine, but by new we are still talking about something from the 1950's. The engine pulled ok to be sure, but only after filling the lock chamber with a huge cloud of blue diesel fumes. 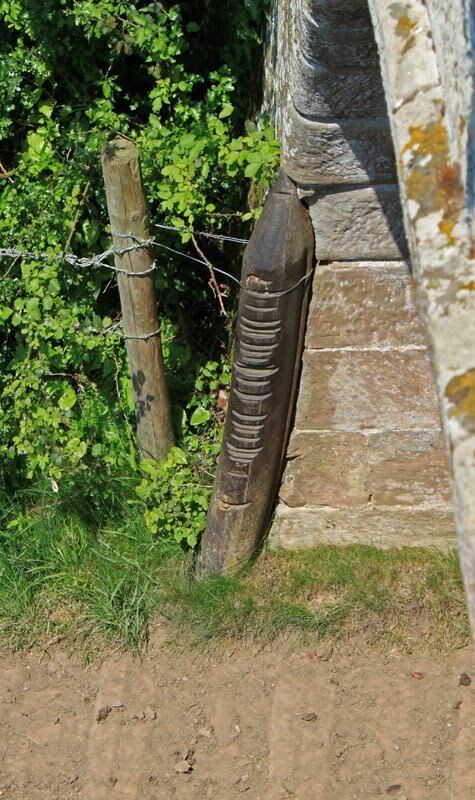 This echoed an observation of nb Frankie with whom we shared a cassion at Anderton and who we were to meet again at Stone. Frankie had a much used R&N unit which was tricky to start and kicked out black smoke which coated the stern and its skipper in spite of an over length exhaust pipe. To be fair, the skippers seemed completely unconcerned about this downside but personally I am but sure that peering into a pall of smoke hour after hour would not hit the spot for me. I would love a vintage engine gleaming in it's engine room, perhaps like Revilo with its new R&N as reviewed by Adam in June's Canal Boat. But I don't fancy authenticity at any price. I think I will stick with my utterly reliable, economical, quiet and smoke free Beta for a bit longer. 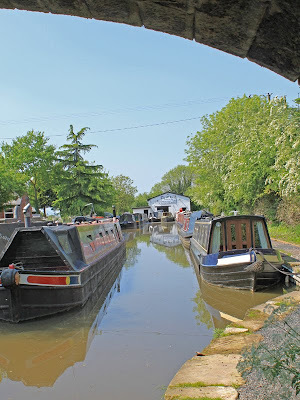 We ended up mooring just below the Stone bottom lock, walking back to the Star for a rather average Stake and Ale Pie before returning to WB and watching part of a DVD before sleep overcame me. All these early moring photo expeditions are getting a bit much.